For patients in Athens and throughout Henderson County, Dr. Mark Roberts is the dentist of choice. Dr. Roberts is more than just a trusted member of the health care community here, he's also a distinguished leader in his profession, who is involved in setting dental healthcare standards in East Texas and beyond. Dr. Roberts has been practicing dentistry since 1996 and is a proud graduate of the University of Texas Dental School in Houston. He opened his offices in Athens in 2005, and has built a thriving dental practice that serves the needs of patients ages six and up. Dr. Roberts and his staff are committed to ensuring that every patient is treated with kindness and just the right amount of TLC. A complete list of our services is located here. Whether you are coming in for a routine cleaning or you are in need of major restorative work, you will be greeted kindly at our door and will be provided with the personalized treatment that meets your individual needs. Dr. Roberts has hundreds of satisfied patients and a practice dedicated to ensuring quality dental health for all. Dr. Roberts and his staff are available five days a week for scheduled appointments. 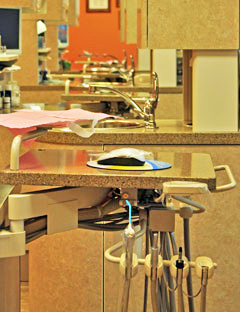 The staff will also do everything possible to accommodate emergency situations that require dental attention. Most dental emergencies can be handled within 24 hours. If we are unable to see you, we will gladly refer you to our colleagues in the area. We also work with oral surgeons, pediatric dentists, and other dental specialists to ensure that all our patients get the best possible care for their unique needs.